SnapFlow for Mac is a tool for selection of images in videos. In a few clicks, SnapFlow for Mac allows to identify the most interesting pictures in a video, and to apply the same treatments as those that a photographer before a selection of photos: comparison, improvement quality, creation of ready printed documents. Turn your videos into a unique source of high-quality pictures! 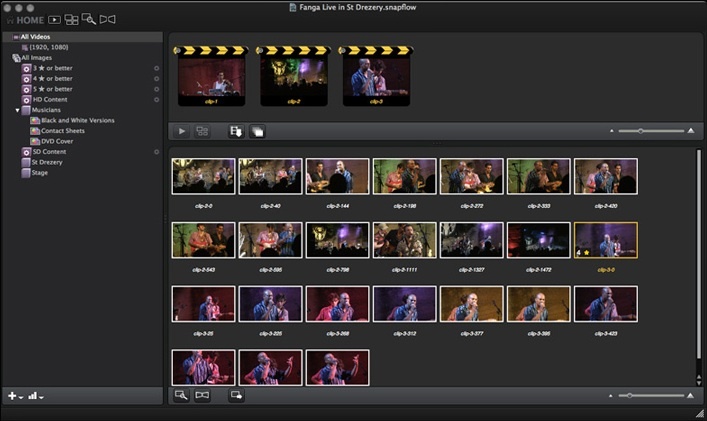 SnapFlow for Mac comes with some great pre-defined workflows that let you create DVD covers for your video material. You can even create and save your own models. SnapFlow for Mac understands all Quicktime formats including the HD formats used by professionals. Snapflow also handles raw HDV/MPEG-2 footage and AVCHD footage and includes an advanced deinterlacing algorithm that will give you stunning still images from interlaced data. Qweas is providing links to SnapFlow for Mac 1.0.1 as a courtesy, and makes no representations regarding SnapFlow for Mac or any other applications or any information related thereto. Any questions, complaints or claims regarding this application SnapFlow for Mac 1.0.1 must be directed to the appropriate software vendor. You may click the publisher link of SnapFlow for Mac on the top of this page to get more details about the vendor.